San Francisco Market Review- What Will Happen in 2016? As we enter a new and exciting year in 2016, I just wanted to share with everyone a quick summary of what SF real estate market would look like in 2016, as I've been recently reading many reports released by various sources including San Francisco Association of Realtors, California Association of Realtors, Fannie Mae etc. Price: The San Francisco median sales price was up 15.7 percent(y-o-y) to $1,150,000 in 2015. Home prices should continue to rise in 2016 but perhaps at a tempered pace as the market approaches a natural balancing point. As Fannie Mae sees it, the year ahead will be less like a person in love and more like one in a satisfying long term relationship. Inventory: Inventory went down by 3.7% in 2015. It should rise in 2016, but that will depend largely upon the addition of new construction along with would-be sellers tapping into a market already in their favor. List Price Received: in 2015, sellers received an average of 111.7% of the listing price. Sales prices are expected to increase slightly in 2016, which should translate into further increases in list price received. Affordability: Affordability is a key concern for the housing market not only in SF but also throughout California. Fannie Mae predicted that affordability will shrink further as strong home price gains still outpace household income growth. Mortgage Rate: Interest rates did not go up earlier in 2015 as was widely anticipated, but the Federal Reserve finally took action with a short-term rate increase late in the year and is expected to do more of the same with some consistency in 2016. 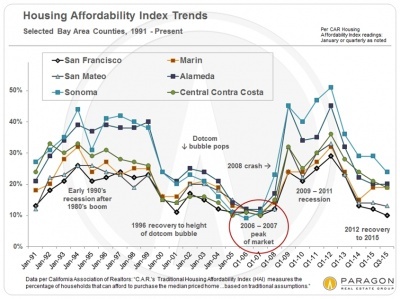 Significant increase though can obviously affect the housing affordability in SF(10%), which is already just 2% above the historic low in Q3 2007. For those who want to read the full report of CAR(California Association of Realtors), please see below. 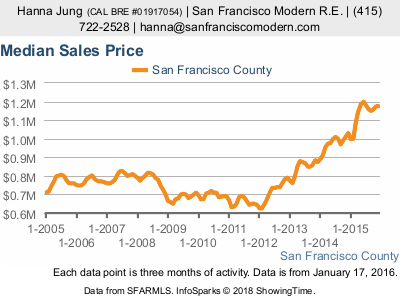 I will be happy to share more detailed local data or information about San Francisco real estate market if anyone is interested, so please don't hesitate to contact me if you have any questions or need further information!